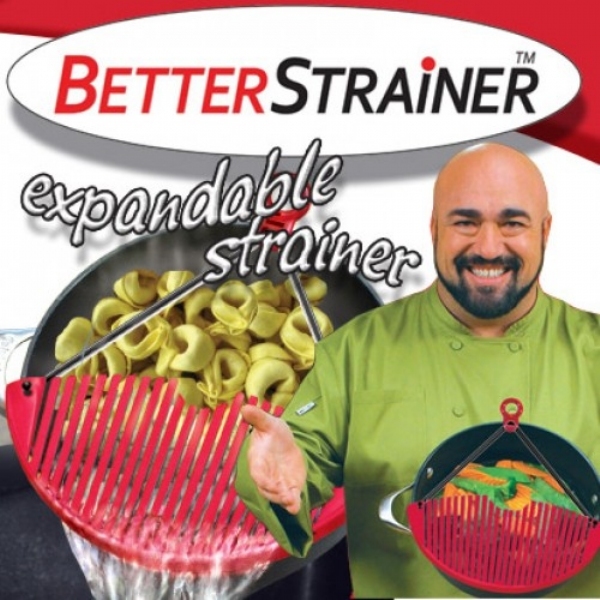 Better Strainer the expandable strainer fits any size pot, pan, skillet or bowl. Better Strainer the expandable strainer fits any size pot, pan, skillet or bowl. The Better Strainer as seen on TV is easy to use just fit, snap and drain! The secret is the "flex fit" design that grabs on and then locks tight to ensure a safe and secure pour every time. Better Strainer makes draining grease, cooking oil and water easy. No more bulky colanders. Perfect straining pasta, grease from meats and juices from fruits and veggies. The non-stick surface won&apos;t tear delicate food like ravioli. Compact for easy storage. Great for draining fat from cooked ground beef. Can&apos;t make a definite survey on this item yet because it was given to my girlfriend as a gift, but she seemed quite happy with the product and is anxious to try it. Haven&apos;t figured out how to use it yet...doesn&apos;t look like it will work. I cannot get the product to stay on the pan to drain fluid. Maybe I am just not mechanically inclined, but no matter how I try to attach it, it doesnt stay.